A secret garden is seen beyond the archway in this tapestry "The Secret Garden". A cobble-stoned terrace lined by charming potted plants and topiary, we see beyond a secret garden of polar trees and manicured lawns and flowerbeds. Scenes such as these of Tuscan villas and landscapes shows us the way that rustic homes such as this seeks to interweave closely with nature. A lovely scene to bring the beauty of the outdoors in. 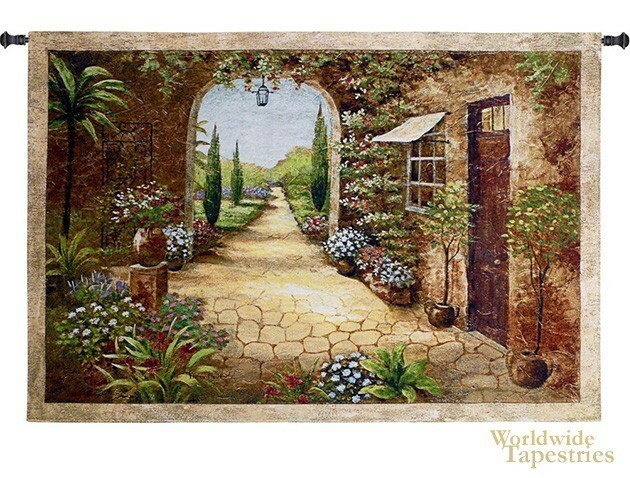 This Italian countryside tapestry "The Secret Garden" is backed with lining and a tunnel for easy hanging. Note: tapestry rod and tassels, where pictured, are purchased separately. Dimensions: W 55" x H 37"